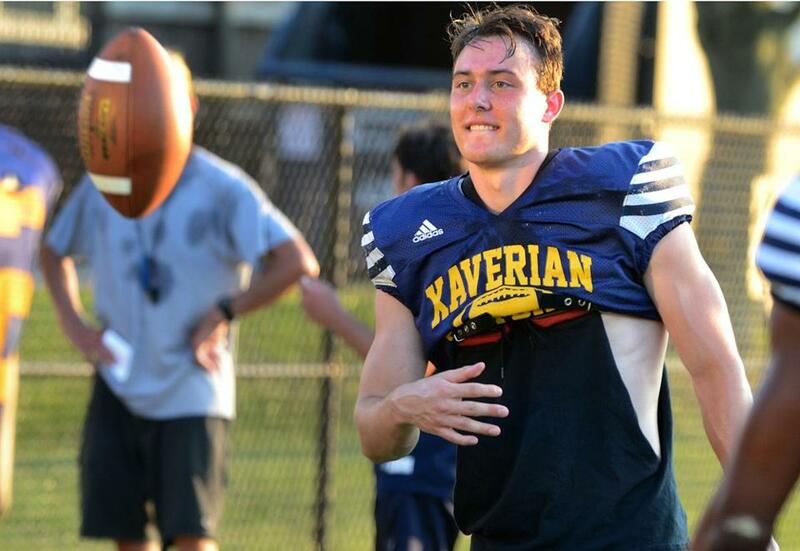 Xaverian’s Cooper DeVeau was a three-phase standout for the Hawks in a 35-19 win over Archbishop Stepniac (N.Y.) on Saturday. Cooper DeVeau, Xaverian — The three-phase standout was everywhere as the Hawks (2-1) redeemed last year’s loss at Archbishop Stepinac (N.Y.) with a 35-19 win Saturday. The senior caught three balls for 89 yards and two touchdowns, adding a 50-yard fumble return for a touchdown. Noah Leonard, Taunton — The senior quarterback threw for 226 yards and three touchdowns on 16-of-20 passing as the Tigers defeated Oliver Ames 30-6. Matt Smith, Needham — The Duke-bound tight end was a matchup nightmare for Newton North on Saturday, pacing the Rockets (3-0) to another win with 10 receptions for 153 yards and a touchdown. Will Lederman, Natick — The sophomore quarterback scampered 60 yards for the game’s first score and threw for 275 yards and three more touchdowns as the host Redhawks (1-2) rolled to the Bay State Conference win over Walpole, 42-14. Thomas Le, Quincy — The junior tailback rushed for over 100 yards and two touchdowns, while also intercepting a pass at linebacker on defense, as the Presidents got their first win of the year with a victory over Silver Lake, 14-6. Shiloh White, Wellesley — The sophomore running back rushed for a 47-yard touchdown and accumulated 144 yards on the ground in the Raiders 42-0 win against Durfee. Matt McCarthy, Danvers — The versatile running back scored three touchdowns in three different fashions, including a 15-yard run, 35-yard catch and a 91-yard kickoff return for the Falcons (3-0). Through three games, the senior has eight total touchdowns. Leonard St. Gourdin, Malden Catholic — In upsetting 16th-ranked Lynn English, St. Gourdin had 64- and 42-yard TD receptions. When the Bulldogs were able to pull within a score in the third quarter, St. Gourdin’s 85-yard kickoff return for a touchdown took all the wind out of English’s sails en route to the first win of the season for the Lancers. Jimmy Gibbons, Winchester —The surprising Sachems improved to 3-0 for the first time since 1999 on the back of Gibbons, who totaled 202 yards on the ground against Arlington, including rushing touchdowns of 68 and 50 yards. Ryan Kelleher, Hopkinton —The senior quarterback was 17-of-27 with 271 yards passing and two touchdowns as he led the Hillers past Norwood, 28-6. Jaison Tucker, Wayland —The sophomore rushed for 180 yards on 10 carries and scored four touchdowns in a 46-21 win over Boston Latin. Kevin Peete, Melrose —The senior running back scored three touchdowns in a 28-13 win over reigning Division 5 North champion Watertown. The Red Raiders bounced back from a loss to a tough Lincoln-Sudbury team. Geoffrey Jamiel, Dennis-Yarmouth — The sophomore scored four touchdowns in the Dolphins’ 34-14 victory over Nauset. Jamiel had 12 catches for 137 yards, including a 25-yard score in the fourth quarter. Pat Damon, Hanover — Damon had five catches for 74 yards and three touchdowns in the Indians 39-6 win over Pembroke. The junior also had an interception on defense. Marvens Jean, Saugus — The junior rushed for 182 yards on 17 carries and a touchdown in the Sachems 14-0 win over Salem. Jean recorded a sack on defense and converted four first downs to keep possession in the fourth quarter. Christos Argyropoulos, Stoneham — The first-year starting running back powered the Spartans to a 44-14 win over Burlington, racking up 220 yards and four touchdowns on 25 carries, with all four touchdowns coming inside the 10-yard line. Jovan Marrero, Cardinal Spellman — The Cardinal’s workhorse back, handled the rock 28 times, amassing 217 total yards (185 rushing, 32 receiving) on 26 carries and two receptions, and reached paydirt three times on the ground in Spellman’s 20-7 win over Middleborough. David Cifuentes, Bishop Fenwick — The Crusaders’ star running back increased his season touchdown total to five, scoring three times and running for 176 yards on nine carries in addition to three receptions for 65 yards in Fenwick’s 33-7 win over Pentucket. Dom Russo, East Boston — The senior had four touchdowns, including the winning rush in overtime from 1-yard out to lead the Jets to a 30-28 victory over Brighton in the City League North. James Coughlin/Kevin Opoku, Southeastern — The duo ran wild in a MAC Vocational Large game against Bristol-Plymouth. Coughlin ran for three TD’s and 77 yards, Opoku ran for two TD’s and 125 yards to lead the Hawks (2-1) to a 40-7 win. Ryan Nguyen, Latin Academy — The senior had 200 total yards and his two rushing touchdowns – an 80-yarder and a 30-yard run – led the Dragons (2-1) in a 12-0 City North win over Tech Boston. Jahwon Ryan, Charlestown — The junior running back had two rushing scores, of 65 and 30 yards, along with an 80-yard kickoff return for a touchdown in the Townies’ 24-19 win over South Boston. John Smith, Pope John — In the Tigers’ 41-6 beatdown of Lowell Catholic, the sophomore runner racked up over 300 all-purpose yards, two rushing touchdowns, and had a 100-yard kickoff return for a score. Daniel Oluwasuyi/Taj White-King, Kipp Academy —The two sophomores impacted both sides of the ball in the Panthers’ 28-6 win over Chelsea. RB/LB Oluwasuyi (6 carries for 63 yards, 1 touchdown) had an 80-yard pick-six while WR/S White-King (6 receptions for 115 yards) had three interceptions of his own. Zachary Cyr, BB&N — The senior back tallied 117 all-purpose yards. He ran back a 45-yard punt return for a touchdown and kept the chains moving for the Knights in their 34-8 victory on Saturday afternoon. Luke MacPhail, Dexter Southfield — The junior quarterback threw four touchdowns, including three in the first quarter, to lead Dexter Southfield’s 42-point offensive explosion against Hebron. Reid Tolley, Tabor — The junior quarterback went 17 of 28 passing for 278 yards, throwing for two touchdowns and running for two more scores as the Seawolves rallied from a 16-6 halftime deficit for the ISL win in Marion over St. Mark’s, 34-24.